This page is about the American medium tank M60A2. For other uses, see M60 (Disambiguation). The 152 mm Gun Tank M60A2 is a Rank VI American medium tank with a battle rating of 8.3 (AB/RB/SB). It was introduced in Update 1.69 "Regia Aeronautica". 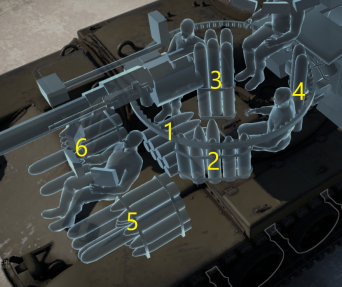 The M60A2 shares the hull with the other M60 variants. That means that the front hull armour is sufficient to stop 100 mm/105 mm kinetic ammunition of the same tier, while it does not protect you against hollow charge shells with a calibre of 90 mm and above. It also has the same 114 mm thick turret base, which is a weak point. The centre part of the turret is a cast 220 mm plate in front of the cannon breech, which while not thick enough to protect you against any shells of even outdated guns, often eats shots (at cost of the cannon breech). The outer parts of the turret are significantly lower than the breech and rounded like in most post war soviet tanks. If not hit head-on, these sides can bounce most of the incomming shots. On top of the turret is a massive cupolar for the commander, which is a big weakpoint and often gets your commander killed, even the whole tank if your opponent is firing shells with explosive filler. The side armour on the hull is thick enough to withstand cannon fire of up to 25 mm (excluding APDS and the part around the gearbox), while cannons with a calibre of up to 40 mm will have significant problems and the tank may withstand a large number of shells. It will however not stop shells fired out of cannons of equal tier. The back of the hull can even be penetrated by HMGs. The turret side is around the cannon is 120-140 mm thick and will resist most shots if angled. The lower part however will most likely get penetrated often due to the reduced thickness the further towards the turret back you get. The hull is completely filled with ammunition, ammo is placed to the left, right and behind the driver (which is sitting in the middle of the front hull). Taking a reduced amount of shells is therefore advisable. The crew is well spaced, a solid shot in the front turret will likely only kill a single crew member, since all crew members sit next to each other and not behind each ohter like in most other tanks, but this obviously increases the chance to get destroyed due to a side-shot. Overall the armour will not completely protect you, but you have good chances to eat a bigger amount of shells than most other tanks. The mobility of the vehicle is average for its tier. 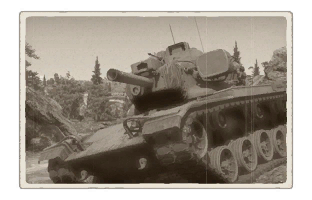 With a top speed of 48 km/h and 11km/h in reverse, it is not as fast as other tanks like the Leopard 1, but fast enough to get where you want quickly. The manoeuvrability is average to bad, you lose a lot of speed while turning, you can, however, turn on the spot thanks to neutral steering. 1 x 152 mm M162 cannon. Ammo racks of the M60A2. You are equipped with a coaxial 7.62 mm LMG and a 12.7 mm HMG on top of the turret. Like on most American vehicles, this allows you to engage lightly armoured vehicles and slow aeroplanes at small to medium ranges. The M60A2 Starship is the perfect combination of armour, firepower, and speed. Based on the chassis of the M60, it has decent mobility and armour. While the addition of the 152 mm gun/launcher allows the player to reliably pierce enemy tanks armour at its tier. The Shillelagh missile unlocks the possibility on long-range sniping, along with the powerful HEAT shell. Or if you are a more aggressive player, flank the enemy and hide your position using your smoke grenade launchers. Your low-profile commander's cupola will be a great help in close quarter combat. However, reload time is not that great so immediately go back to cover after you take a shot. Suggested roles are support, sniper, and flanker. 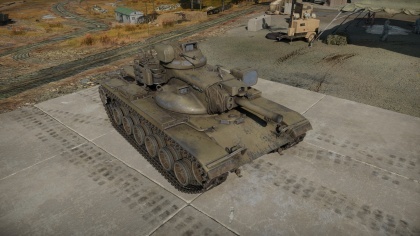 Skins and camouflages for the M60A2 from live.warthunder.com. This page was last edited on 19 March 2019, at 21:10.